I love a good fusion dish, and I love a great bowl of chili. Long ago, a friend who had grown up in Cincinnati told me all about Cincinnati Chili. He was not that fond of Texas chili – it was “too thick…too meaty… too spicy…and where’s the spaghetti?” Huh? I honestly thought he was pulling my leg. But, he went on to explain the difference between our signature dishes. While I grew up on thick, hearty “Texas Red”, jam-packed with a variety of roasted chilies and topped with diced onions and cheese, he explained that the Cincinnati version is very different. Meaty, yes, but the consistency is not as thick in fact almost watery by comparison. The seasonings are different as well, which can include cinnamon, cloves, nutmeg, chocolate, allspice, Worcestershire... And, the chili is served ladled over spaghetti. This is called two-way chili. Top with shredded cheddar and it becomes three-way. The addition of onions makes it four-way, and kidney beans makes it five-way. You can also get your five-way “dry” – meaning the juice will be drained from the chili before it tops your spaghetti. Oh! And don’t forget the oyster crackers. The origin of Cincinnati Chili was traced back to an immigrant from Bulgaria who was born in Macedonia. A bank clerk by day, he worked in his brother’s store by night cooking chili for the customers. In 1922 he opened a restaurant, The Empress, and the original home of Cincinnati Chile was born. Since I am a huge fan of a good Texas Chili, and I love spaghetti, I figured I could come up with a reasonable fusion. The result: Texas Chili Spaghetti - Five Ways. Spaghetti (or Angel Hair, my preference) noodles are covered with thick meaty Texas Chili (no beans! 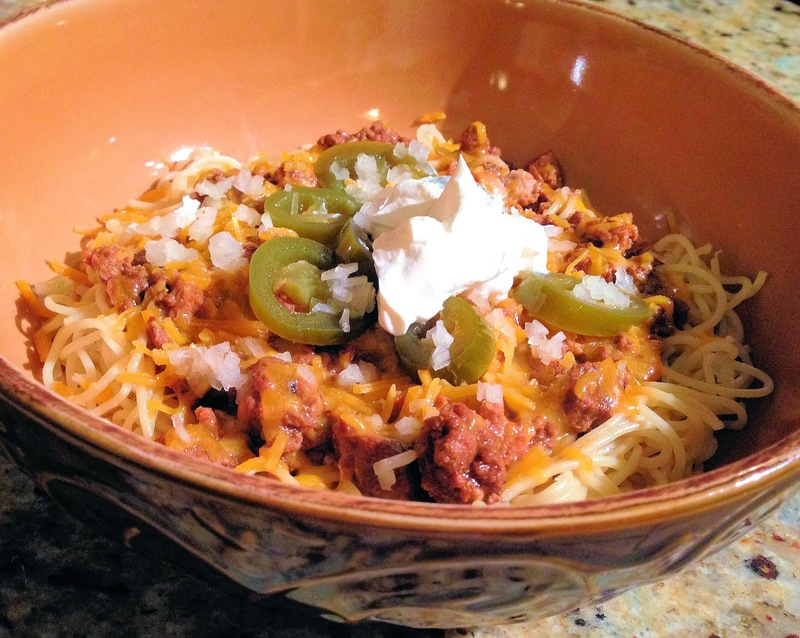 ), topped with shredded cheddar, finely-diced onions, sliced jalapenos, and sour cream. (I don’t know many people who eat sour cream on their chili, but that’s how I roll.) Oh and of course for the Texas version, Fritos would be the stand-in for oyster crackers. This is a great dish for leftover chili, assuming you made enough chili to have leftovers. (For a great recipe - check out my Texas Twister Chili - http://www.wordchefscorner.com/2012/10/texas-twister-chili.html).